News :: Support the Adapted Physical Education program of Pitt County! - Glide Bikes - Balance Bikes for 18 months to 10 years old! Home/News/Support the Adapted Physical Education program of Pitt County! Date added: 02/20/2014 Support the Adapted Physical Education program of Pitt County! program in Pitt County, North Carolina. The APE program is designed to provide physical education opportunities for student with special needs in the least restrictive way. APE teachers assist students with disabilities ranging from visual and hearing impairment, cerebral palsy and autism to Down syndrome and muscular dystrophy. APE teachers help in determining what sort of setting will be the most beneficial for students and help to create a safe learning experience for special needs students to develop and grow. To learn more about the APE program in Pitt County visit their website. 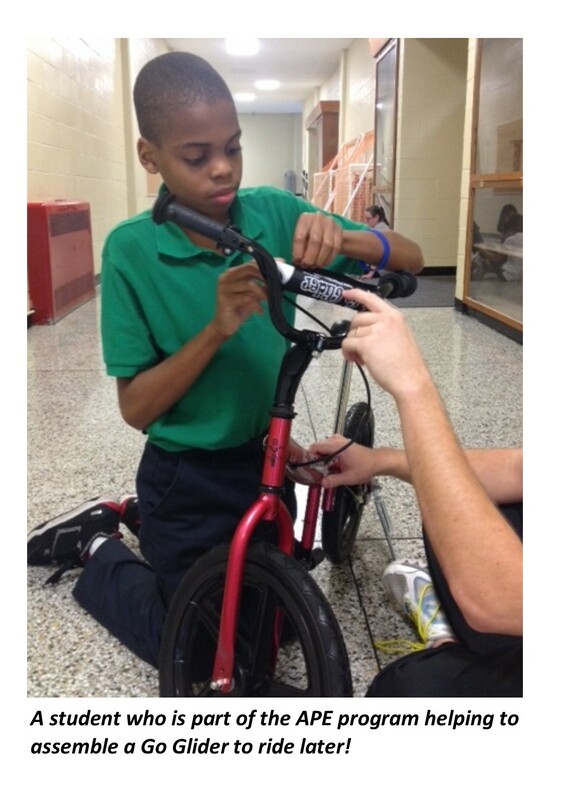 Glide Bikes donated a Go Glider to the APE program a few months ago which has helped add an extra element of physical fitness and education for many of their students. Glide Bikes is now pleased to be donating another Go Glider to the program that will be used in a raffle. The raffle will raise money for the program and will take place during their 4th Annual APE Dodgeball Tournament happening on March 1st in Greenville, NC. For more information about the Dodgeball Tournament, or to register for the event, click HERE.